Offset is taking his love and appreciation for his fiancée Cardi B to a new, permanent level. In fact, as exemplified by a soon-to-be viral clip on social media, the Migos rapper has adorned his neck with a new tattoo of his boo's moniker. The video, which appears to have been taken by Cardi B herself, shows confirmation of the fresh ink appearing on the right side of Offset's neck. The tattoo simply reads "Cardi B" and sits below an existing tattoo, with the romantic gesture garnering all sorts of responses from fans. 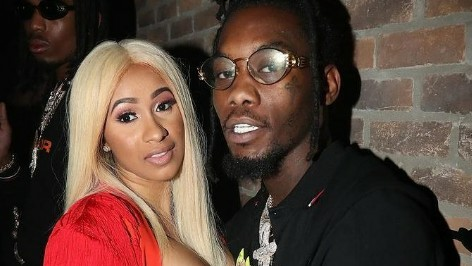 The couple became engaged back in October 2017, with Offset getting down on one knee during a surprise proposal on stage during Power 99's Powerhouse concert in Philadelphia. Take a look at Offset's new Cardi B tattoo, below.